Hello everyone. 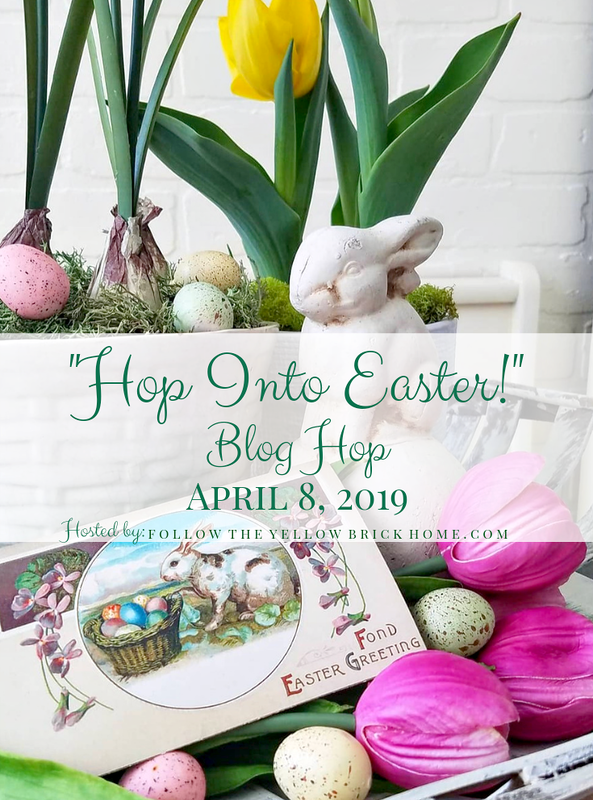 It's time for our Hop Into Easter Blog Hop 2019 Edition. I am beyond excited to be teaming up with 30 fellow bloggers for this fun Spring and Easter Blog Hop. So pull up a comfy chair, grab yourself a cup of coffee, and get ready to be inspired. 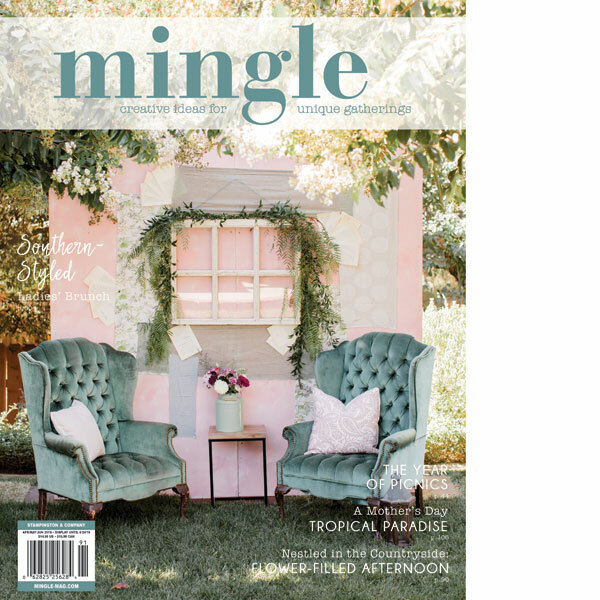 A big thank you to our sweet and talented friend Amber of Follow The Yellow Brick Home for all her hard work and for bringing this delightful round up of talented bloggers that is guaranteed to be filled with plenty of SPRING and EASTER decor ideas. If you are coming over from Judith of Botanic Blue , welcome. I am so glad that you are here today! 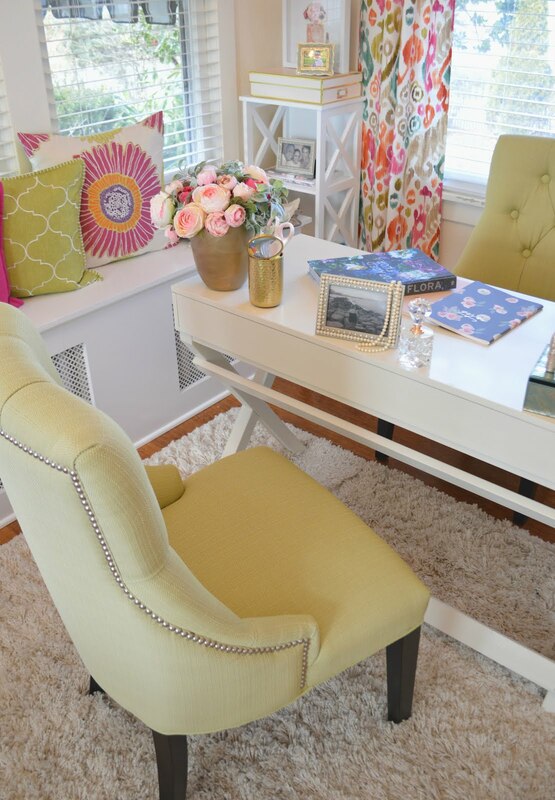 Make sure to check out all the links at the bottom my post for more beautiful spring decor. Spring is most definitely in the air. My favorite time to change things up - refresh our homes, put away the heavy textures and colors and brighten our everyday spaces. One of the easiest ways to give your home a look is buy switching out your accessories like vases, runners, decorative boxes, candles, etc. I typically bring in seasonal flowers such as tulips, and swap the darker winter tones for brighter and sunnier shades. It instantly makes our home feel welcoming and soothing. This is a shot taking in our sun room which is where we have most of our casual meals. When we first bought our home back in 2007, this room was used as a storage room by the previous owners. It was dirty, dark and needed lots of work to bring it back to its original intended use when the house was built in 1920. We thought of taking down the wood paneling to replace it with sheet rock but I decided to give it a fresh coat of white paint, and just fell in love with my new farmhouse room. 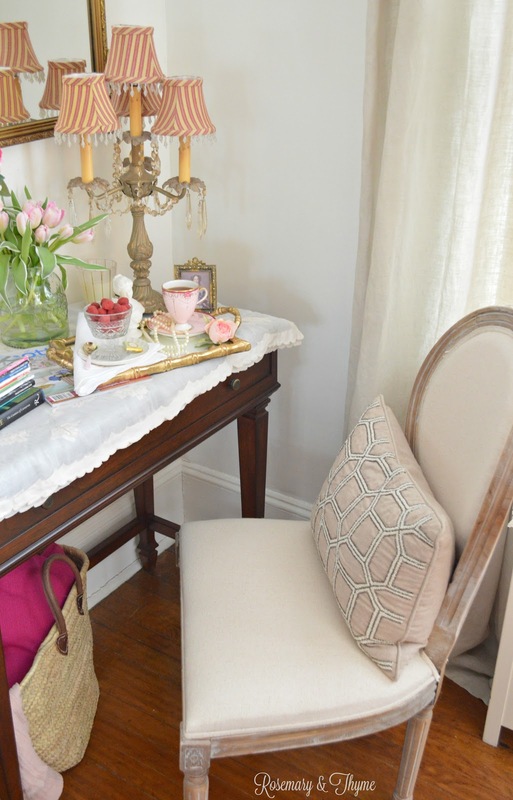 A few fun and seasonal accessories add a touch of Spring and Easter to this cozy room without feeling over done. And what can be more charming and spring like than tulips? White have been my go to color this spring for sure. I just love their softness and understated elegance. 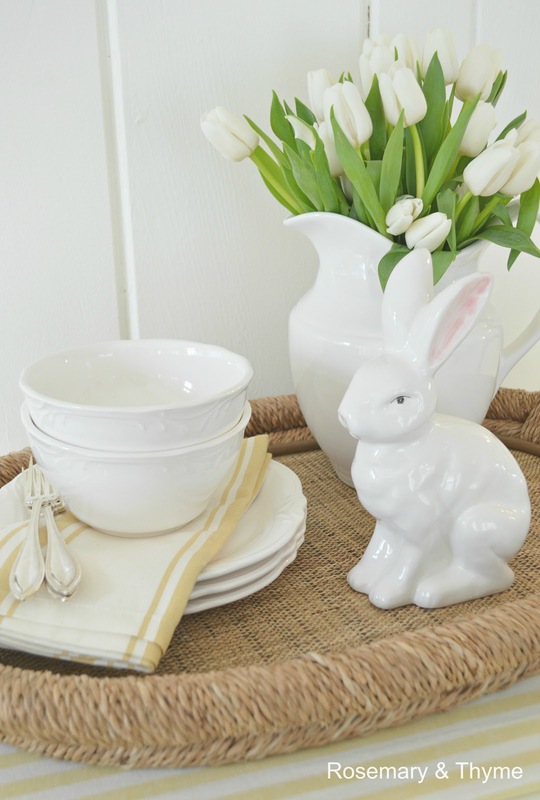 So when it comes to decorating your home for spring, simple everyday items can be your go to. Just add a pop of color with linens in soft tones to give your room a seasonal touch without having to make a large investment. This is a favorite corner in our living room. It gets plenty of natural light and it is where I often sit with a magazine or book to enjoy a cup of tea and relaxation. Add a pretty french market basket with a light throw for visual appeal and romance. 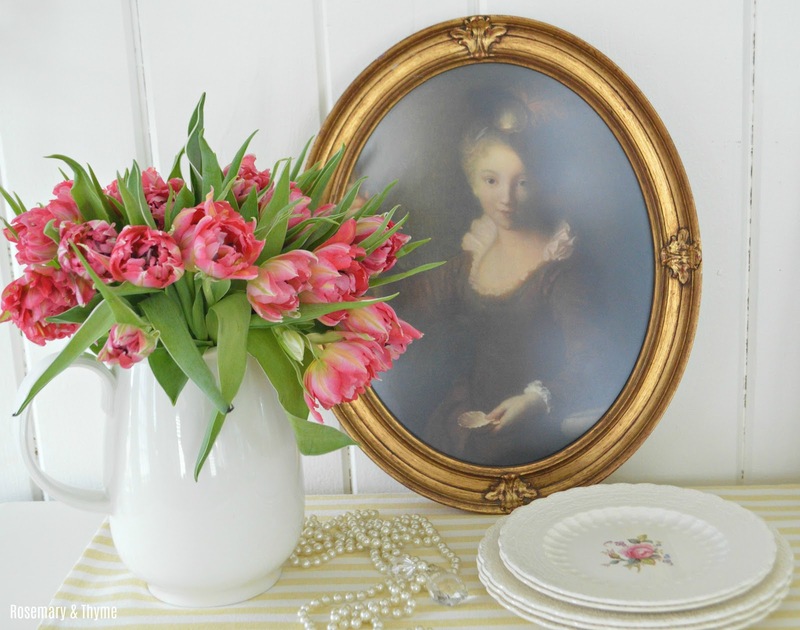 I always like to have fresh flowers and beloved treasures in the corners of our home that are my little havens. During springtime, I bring out my favorite pink tea cup by Niko. 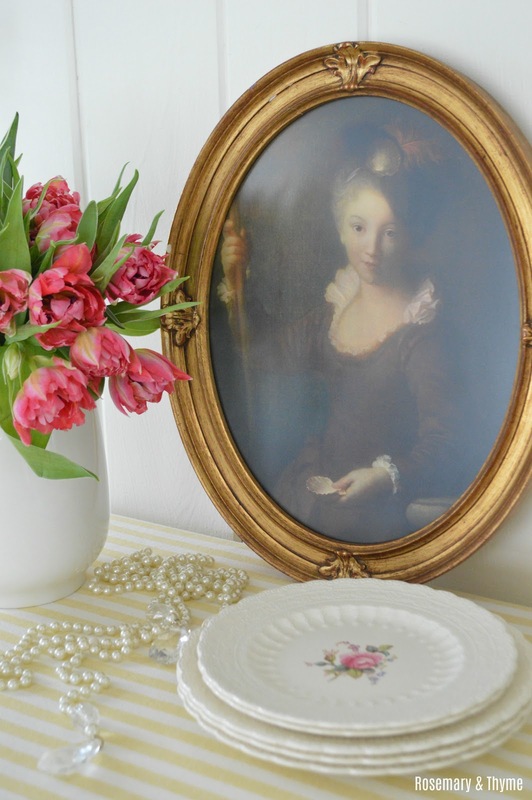 A perfect excuse to add a touch a femininity and old world elegance to this spot. Spring also means that I get to enjoy my garden and the one thing that I anticipate most during this time of the year are my lilacs. Nothing brings me more joy than seeing my lilacs blooms. Of course, their fragrance is the cherry on top. The minute these beauties make their appearance, they take center stage in our home and my tablescapes. This tucked away area in our garden is where you will find hubby and I enjoying a cup of tea and a sweet treat during the warmer months. 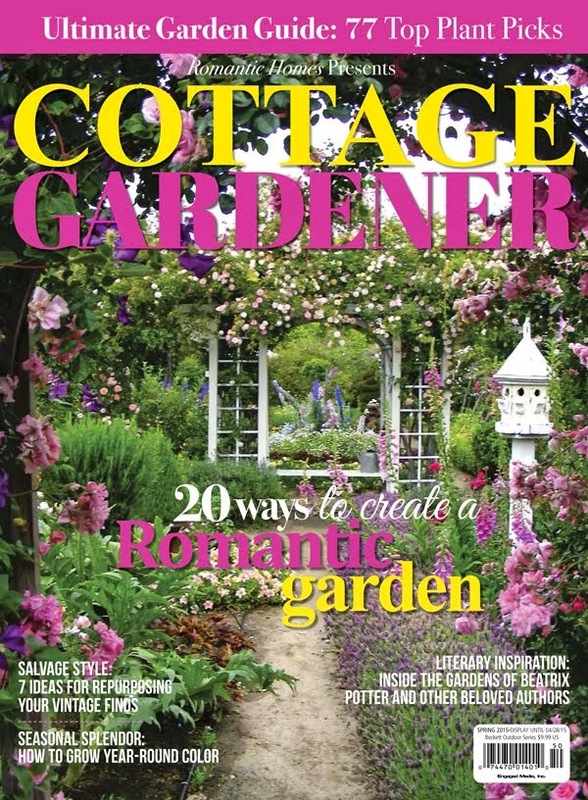 So use those beautiful blooms from your own garden and enjoy them all season. Put them in vases and spread them around in your home. They will add a touch of the season while making you smile. Celebrating the season is a simple as buying some pretty flowers and enjoy their beauty in any little corner of your home. It's about creating easy everyday style without having a big production. Enjoy the things that bring you joy and take the time to appreciate the beauty that you've created in your own home. Thank you for your visit. May you all have a most beautiful and happiest spring season. 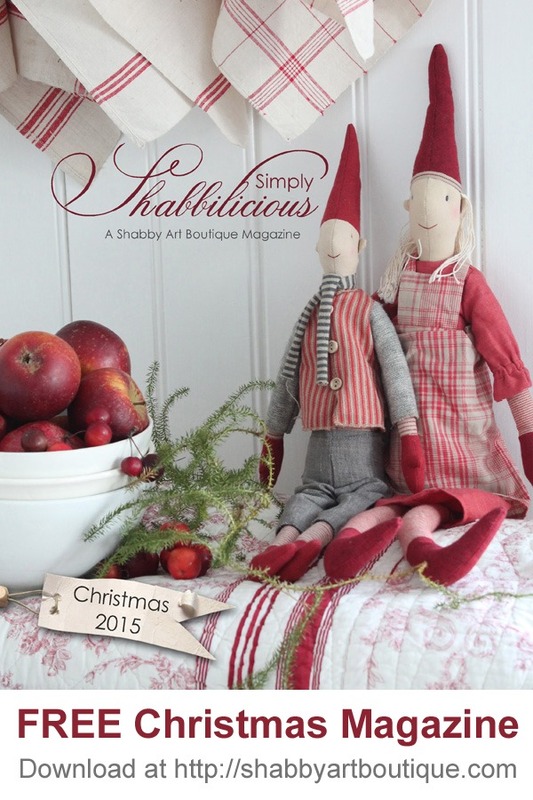 Next up on the blog hop is Angelia of Petite Haus. Be sure to give her a visit too for more delightful Easter inspiration. Your lilacs are stunning. I wish they would grow here. I love your cute sunny corner. Tea in your garden would be a total delight. Beautiful. I wanted to join the party, but it's closed now ! I've been so busy with my sick mother I didn't see this great party sooner ! Please let me know dear Janet if I can still join it. Have a great week dear friend. I would have loved to have you join our group sweet friend. Unfortunately, it is already closed. No te preocupes. Te entiendo!! Mi mama tambien esta mal de salud. I hope your mother is doing better. 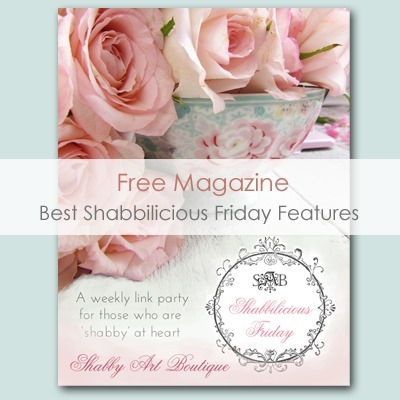 We have a few more blog hops coming up so I will definitely let you know the details. I believe we have a tea one coming in May. Enjoy your week sweetie. Thank you for the support and love!!! You make me want a garden something awful. But all I can grow is weeds. It's sad. 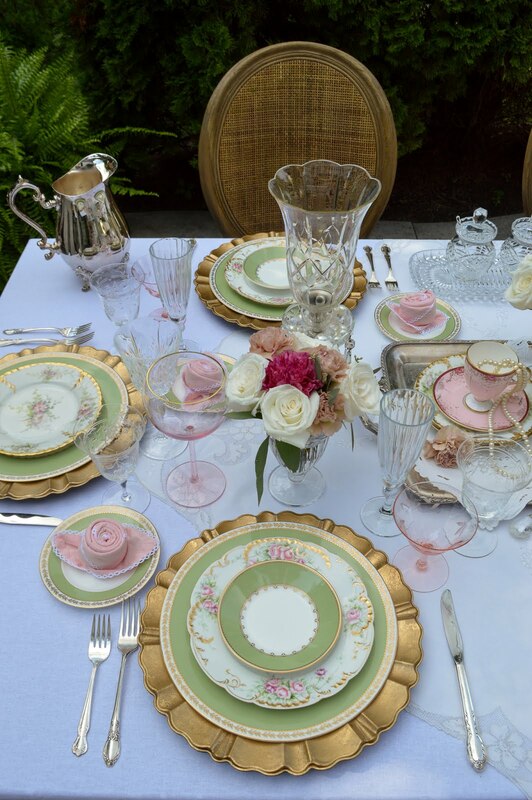 Love all of your feminine touches and all of your china pieces are gorgeous! Your spring decor is beautiful, Janet...oh the lilacs...I can hardly wait! I love your beautiful tulips and the wonderful tea cup. Lots of beautiful eye candy! 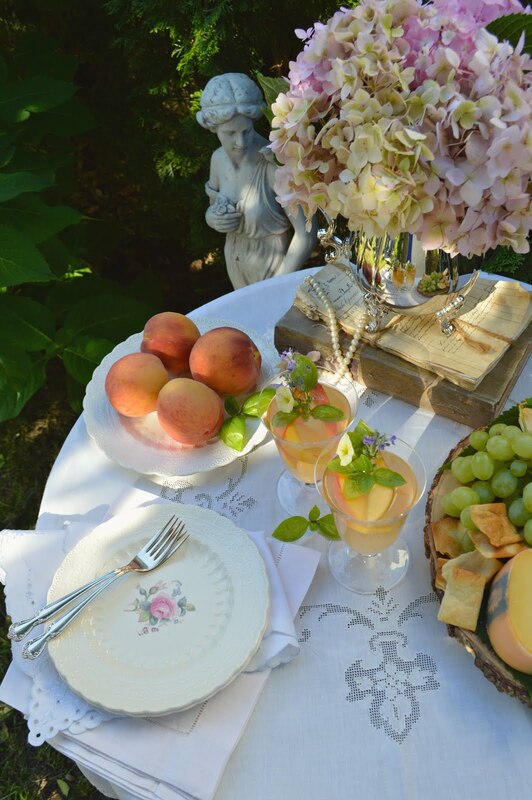 Your table set in the garden is stunning. All of your flowers are so beautiful Janet. You had me at tulips, then I saw the lilacs. Wow! Love that garden setting! All your flowers are so beautiful! There's nothing like tulips for spring - and I love how you have them displayed. And those lilacs are amazing! I could almost smell the lilacs through the computer screen looking at your beautiful photographs. I love lilacs and look forward to them blooming in my neck of the woods. Oh, I know you are anxious to get out in your beautiful garden, and I am looking forward to the lovely photos you will be sharing. You have me so anxiously awaiting the construction we will be doing in our back yard. When that is done, I will finally be able to establish a garden! Unfortunately, we haven't even found a general contractor we are confident of yet. 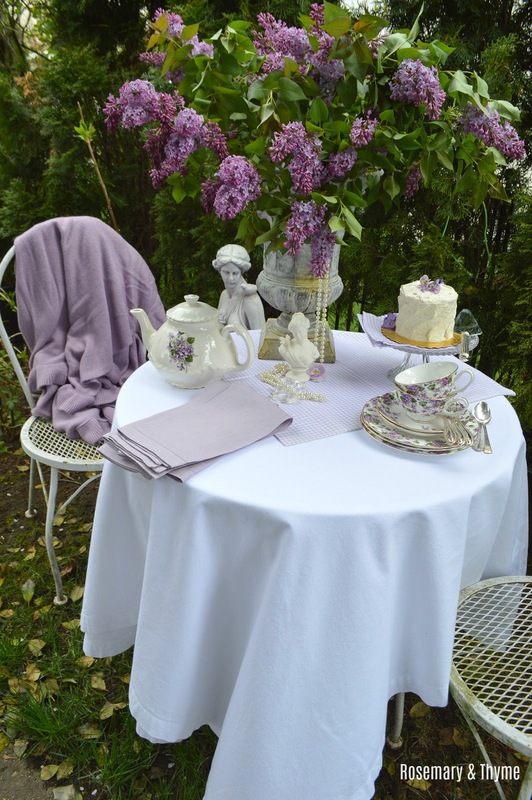 But back to your lovely post, the pretty details of your tea tray, your teapot with the lilacs on it outside. As always, lovely, lovely. Janet, those lilac blooms are absolutely stunning! I longed for their incredible scent. My lilacs won't bloom for some time, and none are the gorgeous, rich color of yours. Janet, first I thought I loved your white bunny and white pitcher best against the white painted paneling (so happy you didn't remove it.). 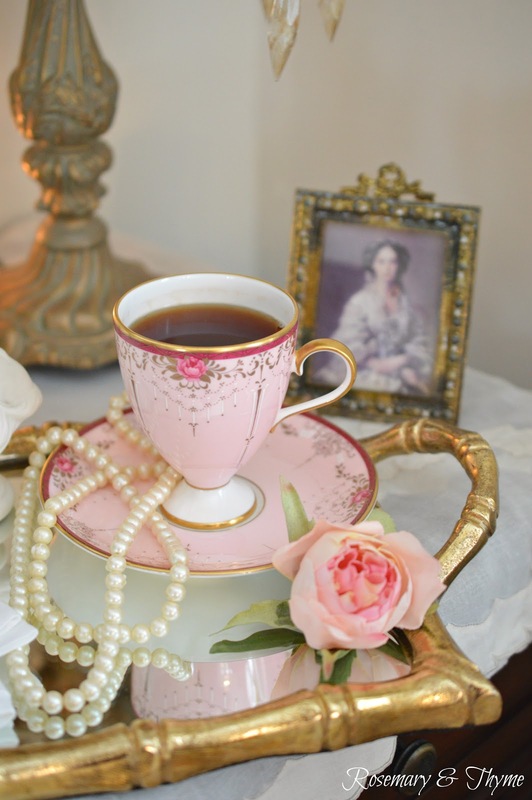 Then I thought it was your sweet table with the pretty pink tea cup. 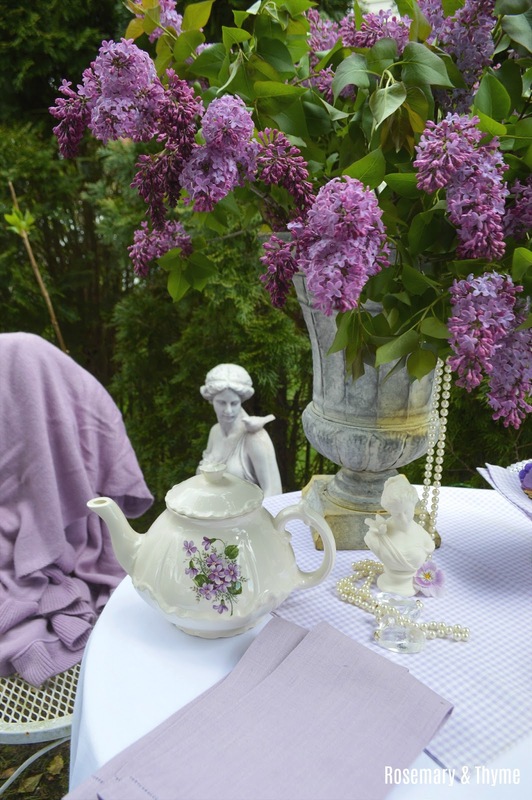 Now it may be your gorgeous lilacs with the teapot and lavender napkins set in the garden. 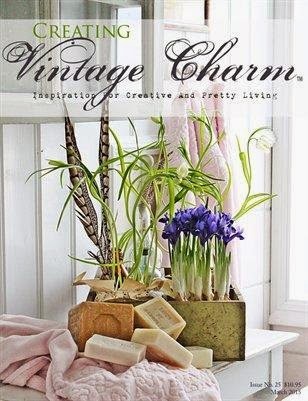 Everything is just lovely and perfect for spring and Easter. Enjoyed being on the hop with you. I love your pretty teacup. It really is elegant! I love Lilacs and can't wait until they are blooming in my garden. Awwww to that heavenly scent!! Janet it is all nothing less than magazine-worthy as always! 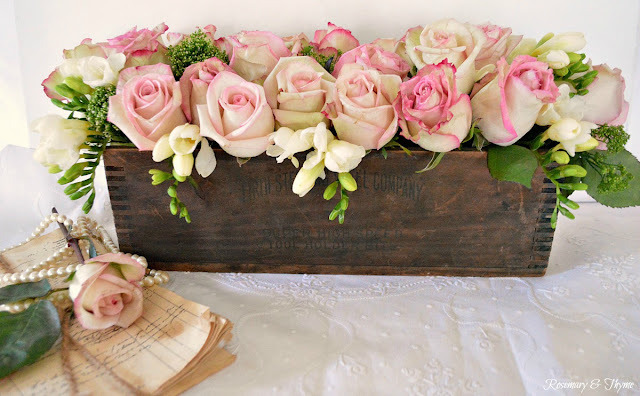 You have so many beautiful treasures and vignettes, and you have used gorgeous flowers to add the perfect touch of spring to your pretty spaces. I LOVE the painted wood paneling. 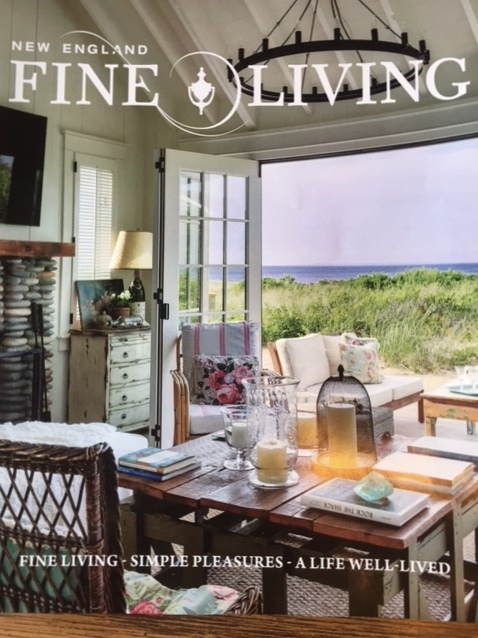 It is definitely cottage style perfection! Thank you so much for joining our hop. Happy Easter! 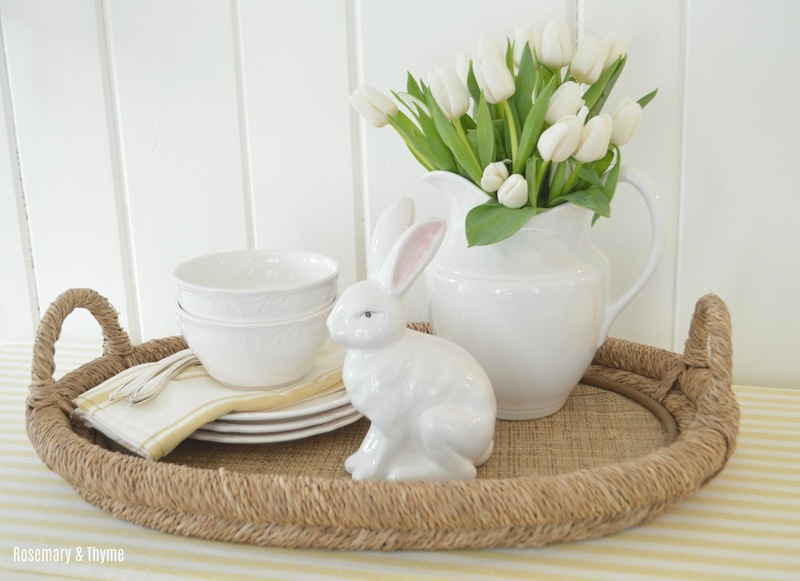 You have so many beautiful Easter things and ideas for how to use them. Your purple-inspired outdoor table is so pretty. I think we have the same white dishes. I bought mine at Pier I a few years ago. Your teacups are so beautiful and I can almost smell your lilacs all the way to our house. We had them at our previous house and I miss them here. Happy Easter! 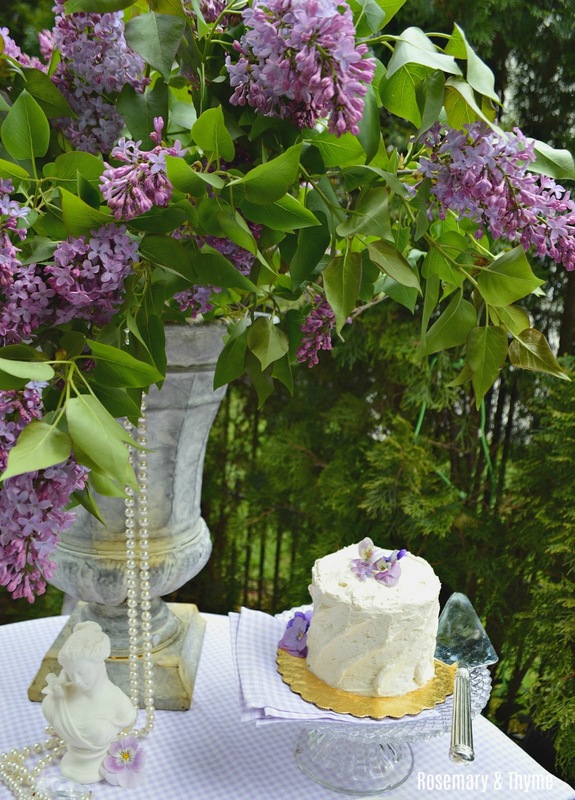 Your old fashioned lilacs are just divine! We just got 10" of snow, so I guess I'll just have to live vicariously through your beautiful photos for awhile!All so pretty! Janet, your Easter decor is beautiful - inside and out! 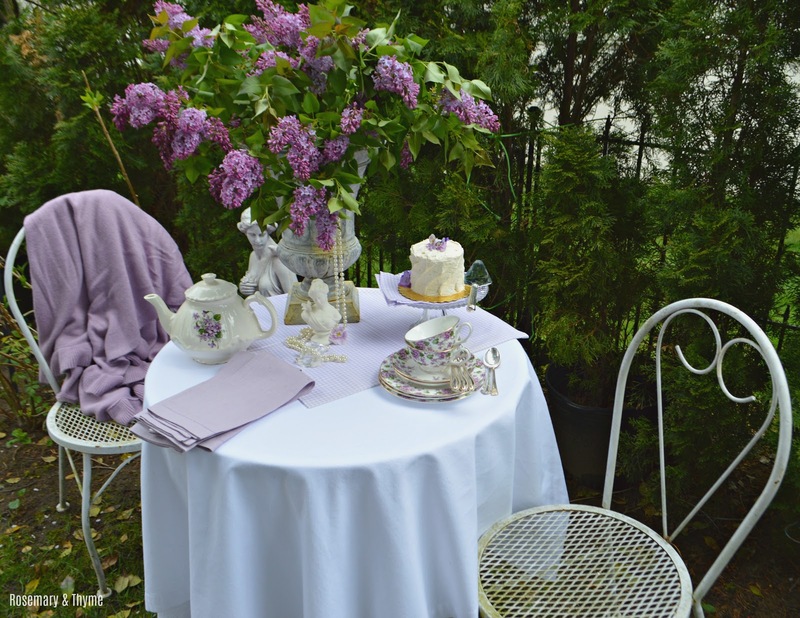 I have a thing for purple so I especially love your outdoor table all set up for tea. And those lilacs are gorgeous! Thank you so much for answering me dear Janet ! Hope I get to see it in May so I can join the party with my Eastert tables and Spring decor. 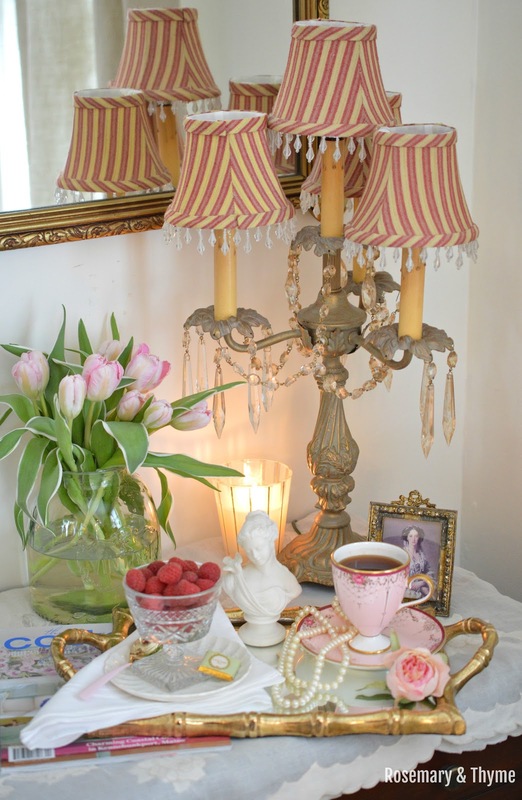 So much inspiration there for me, I was checking your guests, as most parties hardly have tablescapes lately. Hope your mom feels better, it is sad as they age. Mine had a stroke two months ago and I'm the only daughter, even though she's well cared. Oh my goodness everything looks gorgeous as always! 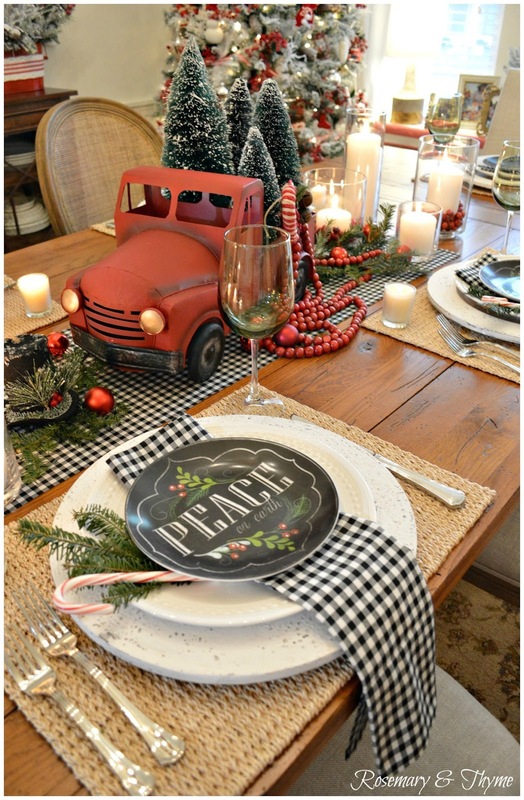 I am in LOVE with your outdoor tablescape and setting! The lilacs are so gorgeous! I would love spend time out there surrounded by such beauty!! 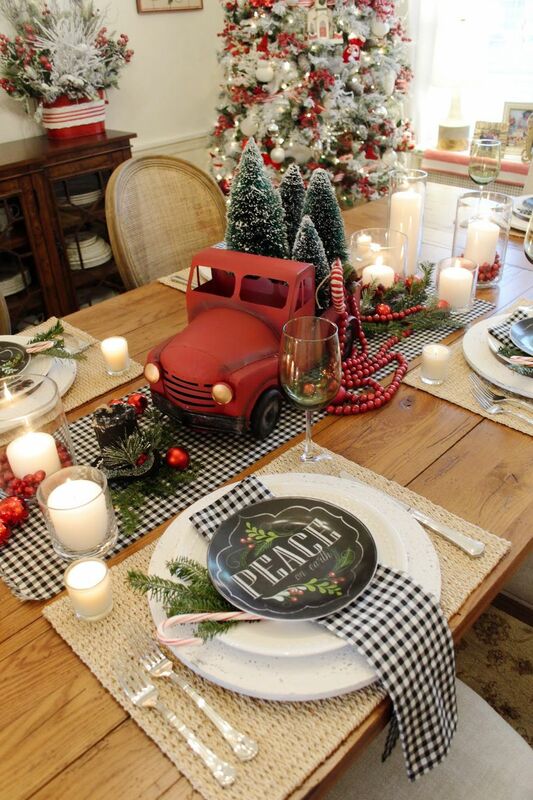 Janet, you are truly the master of the simple tablescape with lots of impact! I'm totally smitten over the lavender table!